I waited long to meet my college mate from Yemen, who is currently married and living in Buffalo/New York to show me how to make this Aseeda. With Aseeda, it is best to see it made in front of you–but I to be able to help you make it with this entry. This is a very rich Aseeda, and can be eaten with honey or the soup [maraq] that it usually comes with. So, choose either or. Plus there is an ingredient that you have to get from Yemen–but you can choose to leave it out if it’s not available on hand. The concentrated tamarind–that by the way is optional but an absolute necessity for us from the southern part of Yemen–will give the soup [maraq] the dark color. 1) 2 tblsp of burned onion–this is the ingredient that we usually get in Yemen. But I think if you absolutely want it, then you can fry some onions, until they are dark, and then wait for them to cool and then grind them. 2) 1 whole chicken–cut into four parts. 4) 2 tblsp of oil–I use Olive Oil. 6) 1 onion –finely chopped. 7) 1 small tomato–finely chopped. 3) salt to taste–make sure the salt is enough because it is what will salt the flour that you will be adding to this as we go along. Let boil. Once it starts bubbling–using a whisk first, and later on as it gets thicker either an aseeda paddle [you can buy this from Yemen] or a strong wooden paddle [by strong I mean it won’t break easily as you work the dough]–add fistfuls of the flour. Add one fistful at a time–waiting a couple of minutes as you add the next. Once it starts to thicken–like a very thick custard stop adding anymore. Let cook under medium heat, and keep on mixing with the paddle. It takes a long time, at least 1 hour and a half for it to cook, even more. So, keep on mixing–not continuously, but like every 10 minutes–and you will see the mixture pull away from the pot and thicken. When it is finally a soft and silky dough that pops out of the pot onto a plate, then it is ready to go. 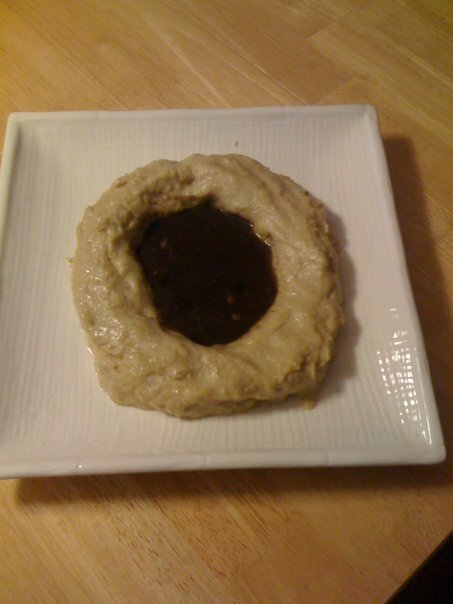 To serve, place on a plate and make a hole in the middle and fill with the maraq [soup] we made earlier. Serve hot. Enjoy. Looks good mashAllah I love your blog. I also have an Arabic blog mostly Saudi recipes. I will add your site to my list. Jazaaki Allah Khayr Sister Noor. I am putting yours on mine as well. Will be trying some of yours out as well insha Allah. Salaam. No I am not Yafi’i but my husband is and my best friend [whom i learned a few dishes from is too]. I am so glad that my recipes are helping you out alhamdullilah. As for the Battat with sauce–it’s just potatoes cut up to look like french fries and then just add bisbas ahmar [already on blog] that you add lemon too, or even tamarind and a little salt. That’s pretty much it. That’s what they sell in Aden in the market, and the girls go crazy after it. I remember those days ha ha ha! Assallammu Aleekum Dr, I really love your cooking. Thank you for sharing this wonderful traditional recipes. I hope you don’t mind I copy and paste your recipe that I love for my own personal use this Ramadhan. Please what’s Juwar flour in English. Thank you. No problem insha Allah. It is called Sorghum in English. Thank you so much for the wonderful recipes. I am American Muslima and my husband is Yemeni so I have used your recipes numerous times and he enjoys all of them. Jazak Allahu khairan. I just have a quick question: On the recipe above, you have 1 cup of milk written two times, once for #2 and again for #3…is this correct?